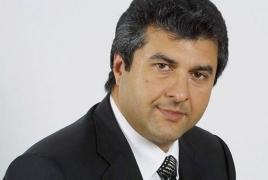 PanARMENIAN.Net - Ukrainian businessman with Armenian roots Oleg Mkrtchan has offered a deal to the investigative committee, claiming he is ready to rat out Ukrainian officials, Life.ru reports. Mkrtchan said he is ready to tell the investigators about the involvement of former secretary of Ukraine’s Security Council Vitaly Gayduk and former head of the Donetsk regional administration Sergei Taruta - who is a co-owner of the Industrial Union of Donbass - in the theft of a $100 million loan from the Vnesheconombank (VEB) issued to the corporation in 2009. Investigators will, in turn, mitigate charges against him. The former owner of FC Kuban and the general director of the second largest metallurgical corporation of Ukraine, the Industrial Union of Donbass, Mkrtchan was detained by a Moscow court on charges of large-scale fraud and was set to be held for two months until April 5. The investigation suggests that the Industrial Union of Donbass received more than $100 million in loan from the VEB for the construction of a metal rolling plant in the city of Armavir, Krasnodar Krai, in 2009. However, soon after receiving the loan, Mkrtchan froze the enterprise construction project and stole the money, investigators assume.